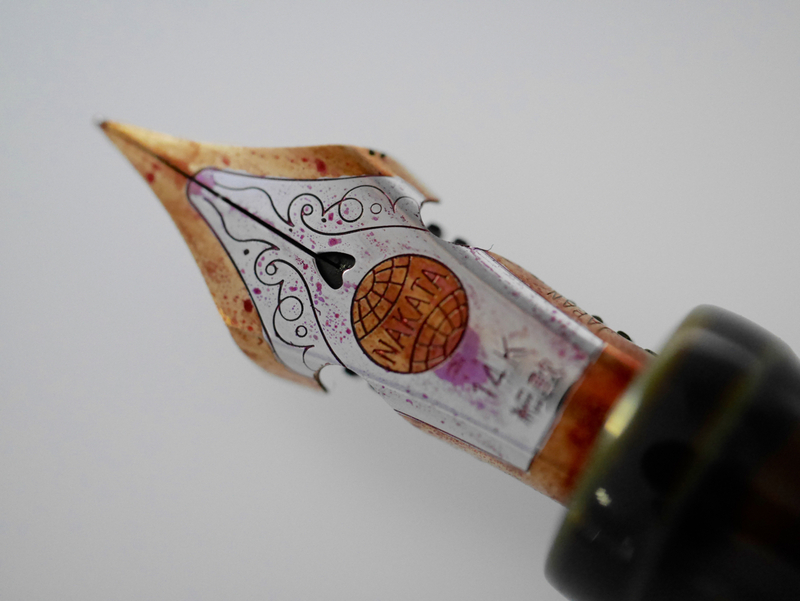 The Nakaya elastic nib FAQ. – Leigh Reyes. My Life As a Verb. 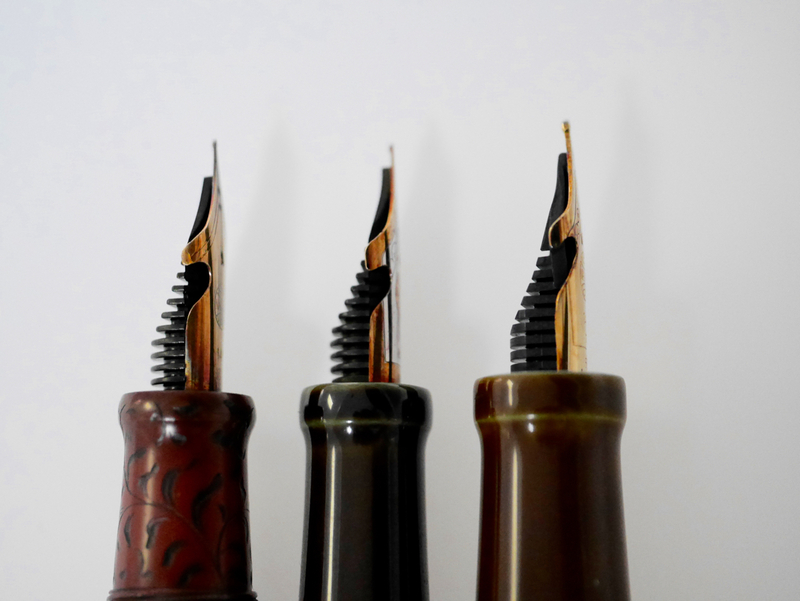 The Nakaya elastic nib FAQ. Elastic nibs were around before Nakaya had them. Many steel dip pen nibs came with shoulder cutouts or slits. Esterbrook even had a double elastic (cutouts AND slits!) on offer. 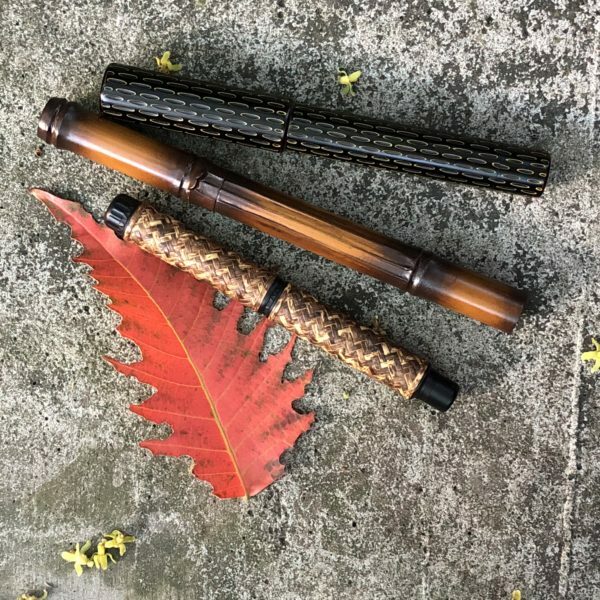 MacNiven and Cameron released their last Waverly pen in the 1950s, an eyedropper meant to remove the hassle of disintegrating rubber sacs in tropical countries. (Julie gave me hers to auction when I did Pens for Aid two years ago.) 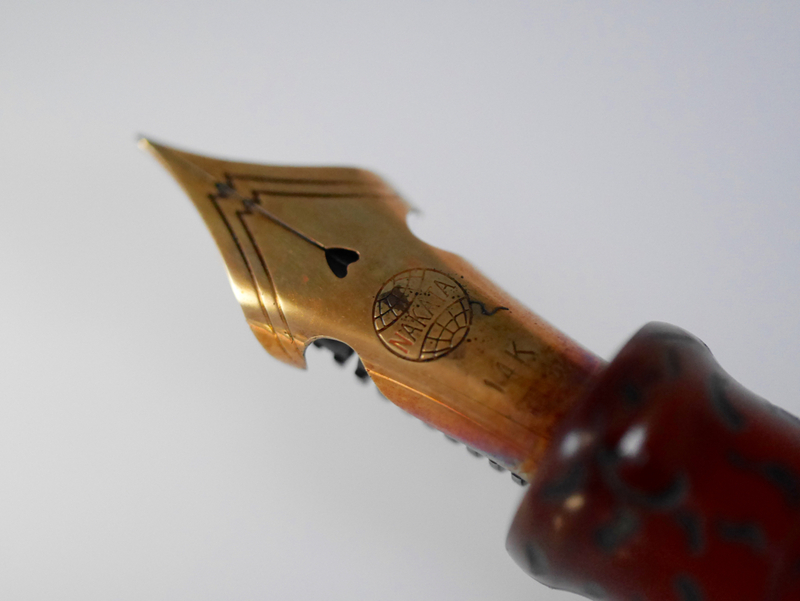 This had a leaf-shaped nib with tiny cutouts. The modern successor to the elastic nib of old is the Japanese G nib. Originally meant for manga, G nibs have a following amongst calligraphers for having reliable line variation. Zebra G, Tachikawa G, and Nikko G all employ similar shoulder cutouts. 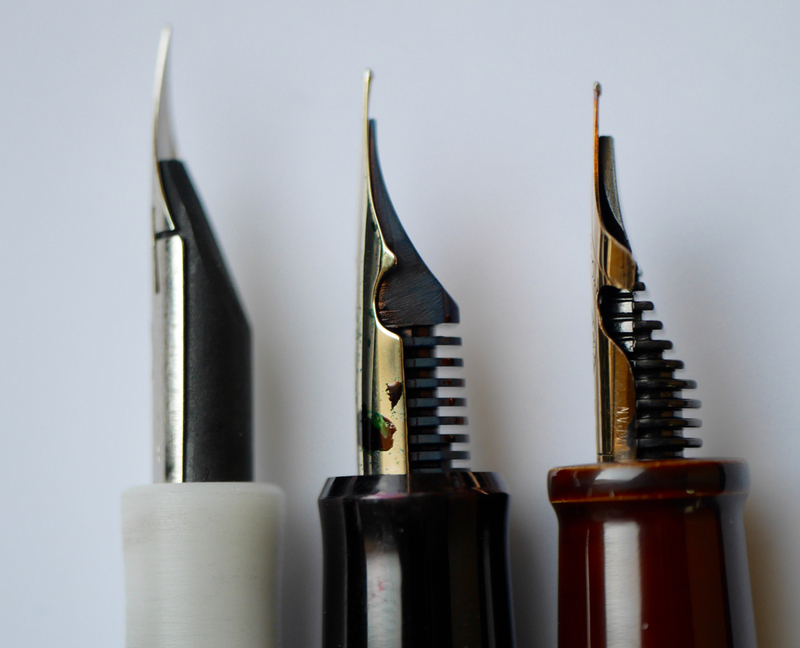 Nakaya is the only modern pen brand with a range of elastic nibs. Pilot’s FA (falcon) nib has shoulder cutouts too, but the result is a semi-flexible nib, not an elastic one. The long tines and straight base have something to do with it. 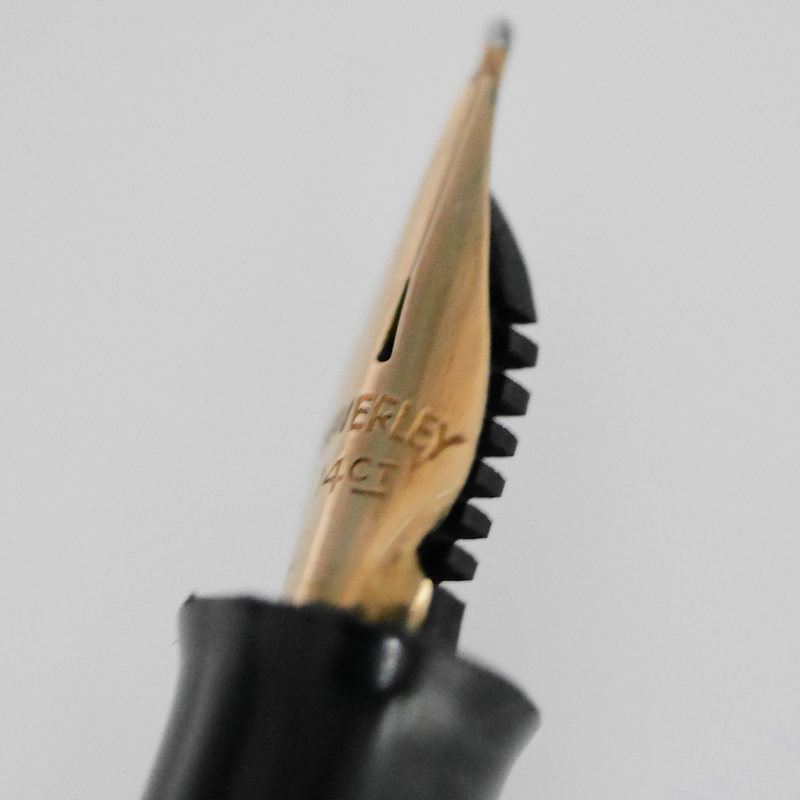 The metal is thinner too, which explains why the nib is so plain (added engraving can weaken the metal). I’ve been lucky to have tried most of Nakaya’s elastic nibs, from super extra fine to music, and own several. Each one has its own personality. These are what people wonder about the most. 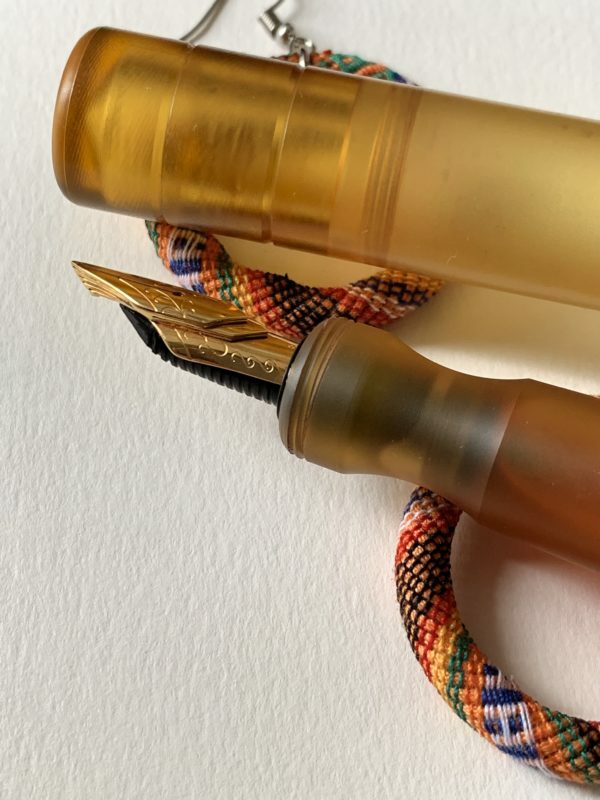 Are Nakaya’s elastic nibs supposed to be flexible? 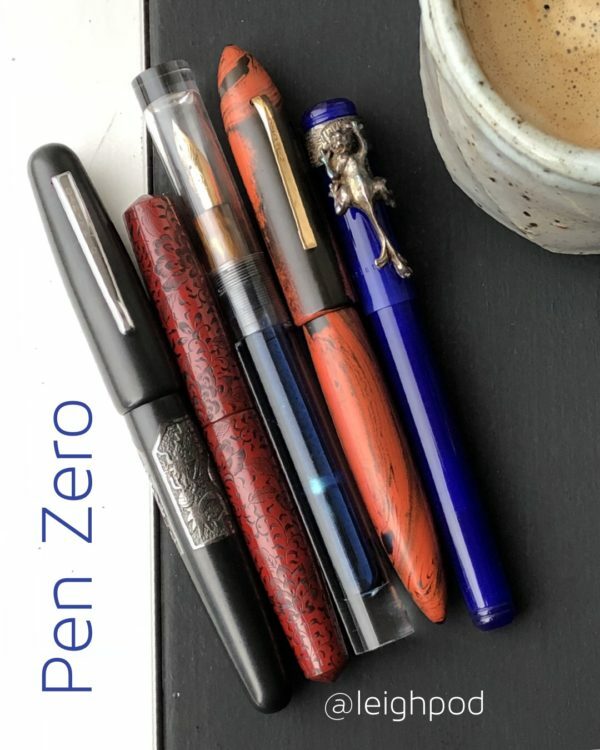 In fountain pen language, “flexible” means “capable of noticeable line variation.” (I would add “and springing back without hurting itself.”) Nakaya’s elastic nibs have shoulder cutouts to help mimic the feel of a brush. This makes a lot of sense when you realize that Nakaya is a Japanese brand, and Japanese characters are traditionally written with a brush. Brush pens and elastic nibs have the same intent – bring the unique responsiveness of a brush into an age that demands convenience (and would confiscate yatates at the airport). So are elastic nibs capable of noticeable line variation? Nope. Only a little. They are semi-flexible at best. 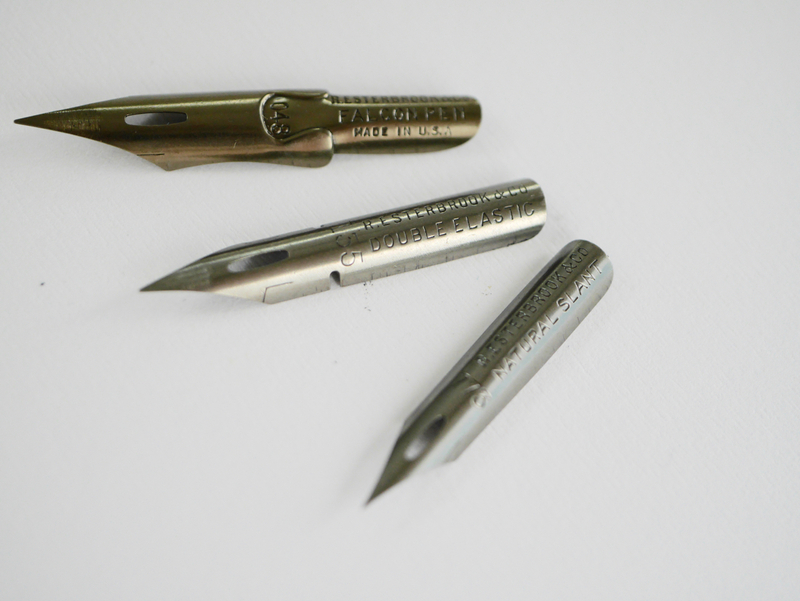 The metal sheet the nib is made of is a standard thickness, so when you add pressure, the nib bends where the cutouts are, but the tines don’t spread. A fine elastic nib could probably manage an F to M.
What do elastic nibs feel like? They feel like writing with a pointed metal brush. In my experience, writing with an elastic nib is less tiring. There’s a springiness and bounce while writing that’s pleasant, and makes me enjoy long note-taking sessions. Elastic nibs also make drawing and doodling more fun. This is the oldest elastic nib I have. 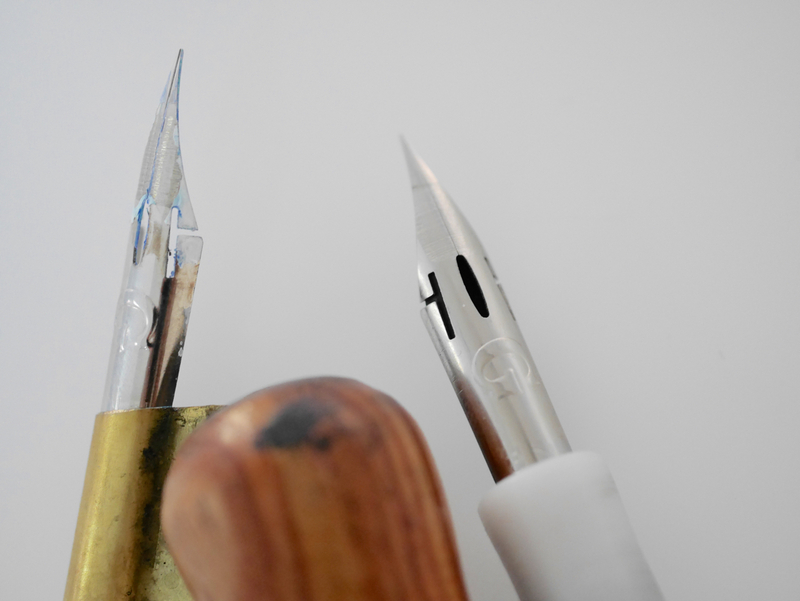 The nib design is still the Mount Fuji/Platinum one instead of scrolls. 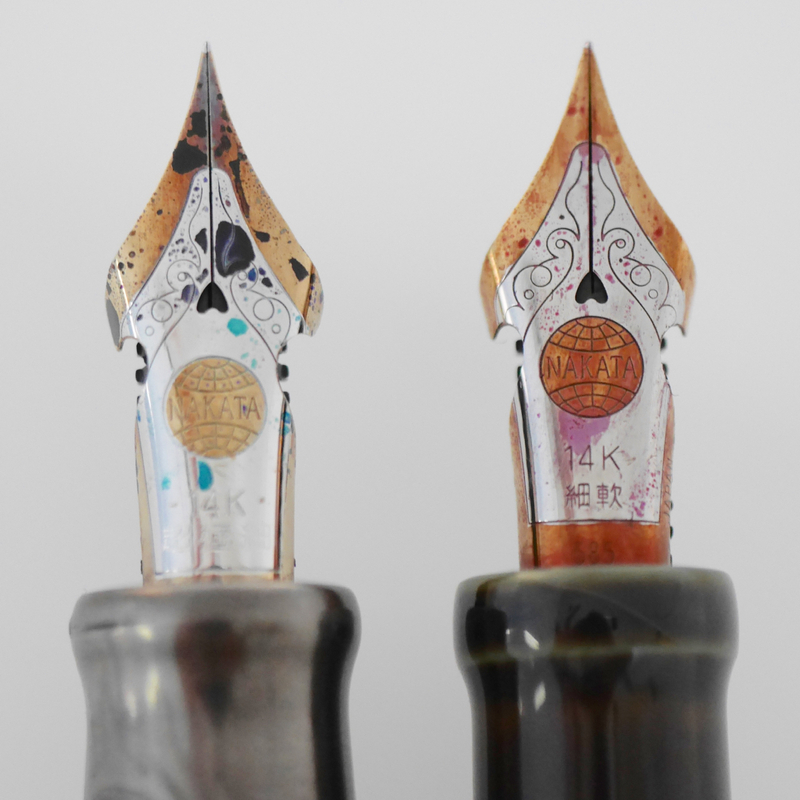 What’s the difference between Nakaya’s soft fine and an elastic nib? 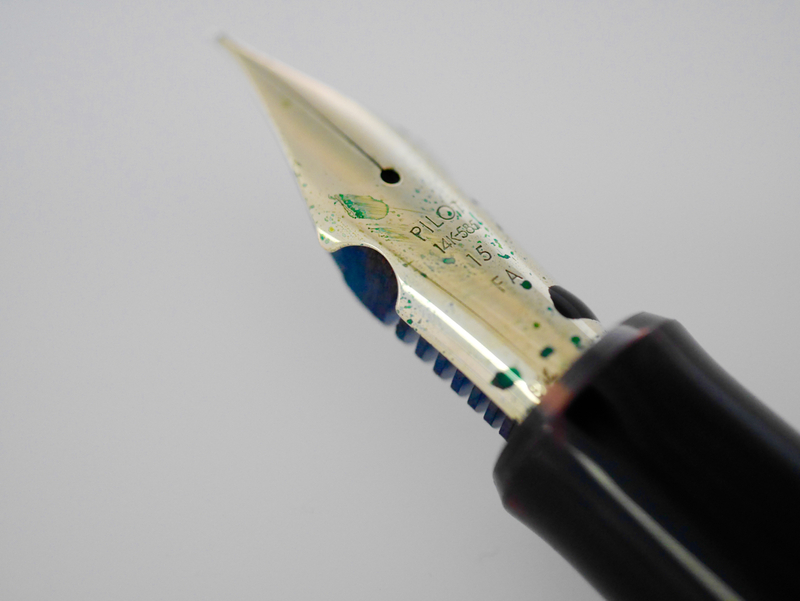 Nakaya’s soft fine nib is pretty much Platinum’s soft fine. It’s semi-flexible – the tines spread a little bit, say from F to B, and adds expressiveness to everyday writing. 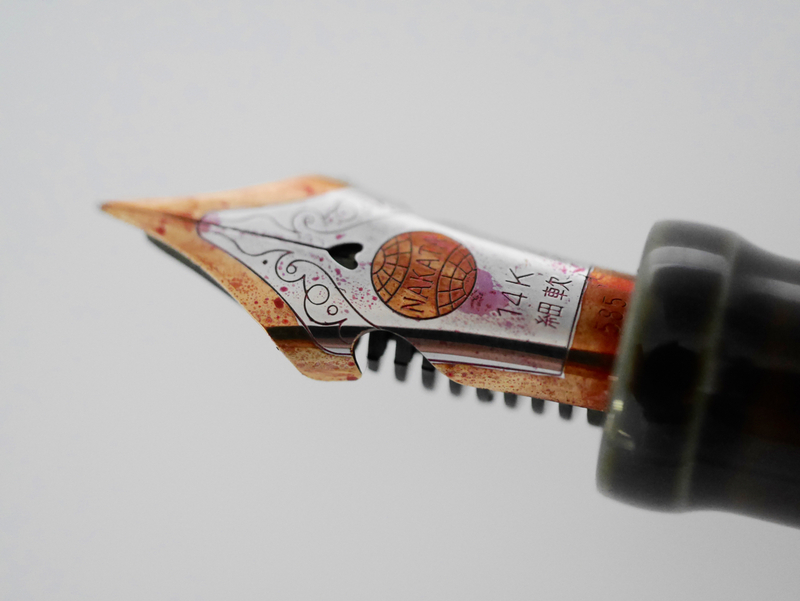 The “softness” of the nib comes from the metal itself and not from cutouts. There’s a faint springiness, but no bounce. Can you have an elastic flexible nib? I expect you could, but it wouldn’t last very long. Flexing a nib stresses the metal. Flexing it a lot, with enthusiasm, stresses the metal at the same points, over time. What about thinning the metal in addition to shoulder cutouts? One thing I noticed while taking photos for this post: Nakaya elastic nib cutouts are done after the nib has been formed. Every single one is different, like snowflakes. Each elastic nib is handmade. Videos make explanations clearer, so I made you one.